It has long been assumed that colourful plumage puts birds at higher risk of being spotted by a predator but a new study has a surprising finding – being dull and brown doesn’t necessarily increase the chances of survival. The large-scale study by a team of New Zealand and Australian biologists used 3D-printed models of an Australian songbird, the fairy-wren, in the study. The species is ideally suited to testing the effects of colourful plumage because the birds vary widely in colour – some have beautiful bright blue feathers while others are a nondescript brown. 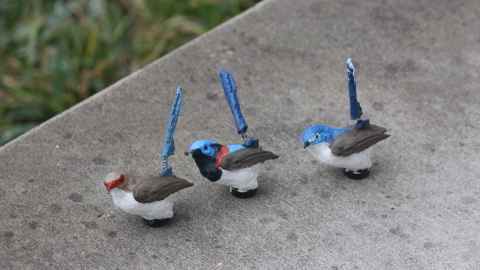 Fairy wrens also cluster together in groups and spend plenty of time on the ground. This mean the research team could place life-like 3D-printed fairy-wren models - complete with moving tail feathers and UV reflective paints – within eight fairy-wren habitats all over Australia. Cameras and field observation were used to monitor the rate at which predators attacked the differently-coloured bird models. What the study found was that birds with nondescript brown bird feathers weren’t any safer than brightly coloured ones so that each model was attacked roughly the same number of times. 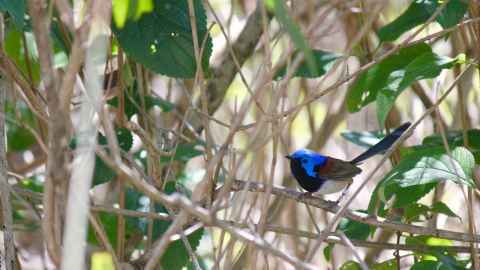 Of 2,511 model fairy-wrens, 331 showed signs of an attack, an attack rate of 13.2%. The attack rate was similar for both conspicuously-coloured models and dull brown coloured models: for conspicuous male the rate was 12.9%, for conspicuous female it was 13.1%, and for a dull female 13.6%. “While being brightly coloured can be important, for example in competing for a mate, the assumption has been that it is costly for birds because it appears to scream ‘here I am, come eat me’,” lead researcher Dr Kristal Cain of the University of Auckland School of Biological Sciences says. “But our results show that’s not the case which is quite a big surprise. It suggests the relationship between predation and colour is not as simple as we might have thought. The study also found a wide discrepancy in attack rates between field sites, suggesting that vegetation cover and location had more effect on the risk of being attacked than plumage.